You’re probably familiar with that tangy, spicy flavor of buffalo chicken wings. And more and more chefs and food bloggers are trying to get that special “buffalo” flavor in new ways. From boneless buffalo wings to buffalo cauliflower and even buffalo broccoli florets, there are plenty of new, exciting ways to get that special buffalo flavor onto your plate. 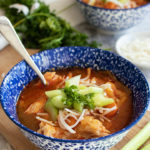 This low-carb, keto buffalo chicken soup recipe is an even more creative way to get the flavor of buffalo chicken wings, but with all of the comfort and ease of a hot Instant Pot soup recipe. This keto soup is high-fat and packed with ingredients that will leave you feeling fueled and satisfied. Top with keto friendly ranch dressing, crumbled blue cheese, diced celery, or additional hot sauce for a unique dinner the whole family will love — even if they’re not keto or low-carb. Bone broth is packed with the amino acids proline, arginine, glycine, and glutamine — all incredible for creating new collagen in your body. You need new collagen for skin health, joint, health, and yes — gut health. Glutamine is especially critical for keeping your gut lining in good shape. It protects the lining of your intestinal wall and may even help heal leaky gut syndrome — a condition where your gut lining gets inflamed and begins to deteriorate[*]. Cauliflower is another food that’s great for gut health — this time because of the role it plays on your gut microbiome. Researchers have known for a while that fiber is great for you, but it hasn’t always been totally clear why. Sure, fiber bulks up your stool and helps it pass through your digestive system more easily, warding off constipation. But why is it that people who eat more fiber-rich diets tend to live longer[*]? It might have something to do with your gut bugs. You don’t digest fiber in the same way you digest other nutrients. Instead, fiber bypasses that process and goes straight to your gut where trillions of bacteria feed off of it. This is great news for beneficial gut bacteria, which increase with healthy amounts of fiber[*]. When you don’t get enough fiber, beneficial gut bugs starve and make way for non-beneficial or “bad” bacteria to take over. Fiber also helps your body create more short-chain fatty acids, which have numerous health benefits — specifically when it comes to gut health[*]. The keto diet, in general, is an anti-inflammatory diet. This has to do with keeping your blood sugar and insulin levels low and creating ketones, which help reduce oxidative stress[*]. It’s also probably because you’re naturally cutting down on a lot of inflammatory foods when you go keto — like sugar and processed grains. And because there are so many anti-inflammatory foods that you can eat when you go low-carb. In other words, the more low-carb recipes you make, the less likely it is that you’re experiencing systemic inflammation. Antioxidants are a great tool for keeping inflammation in check. And you can find a ton of antioxidants in low-carb vegetables like celery, cauliflower, and onion[*][*]. Olive oil is rich in a monounsaturated fatty acid called oleic acid, which has also been shown to reduce inflammation[*]. You need antioxidants to fight free radicals and oxidative stress. Low-carb vegetables like onions, carrots, celery, and cruciferous vegetables are high in antioxidants and come with a number of protective benefits. Onions are packed with different types of flavonoids (antioxidants) that are linked with lowering your risk of conditions like heart disease and cancer[*]. In one study, higher intake of these flavonoids was associated with a lower risk of stroke in men[*]. Carrots are rich in antioxidants like as beta-carotene and vitamin C, both of which help boost your immune system and are associated with lower incidences of cardiovascular disease and cancer[*][*]. And again, with its high oleic acid content, olive oil is anti-inflammatory and packed with nutrients that may help fight disease[*][*]. When it comes to making soup, nothing is more convenient than an Instant Pot. And for this keto recipe, that’s the only cooking tool you’ll need. If you don’t have a pressure cooker, you can also make this soup in a slow cooker or on the stove top. For your Instant Pot, follow the instructions below. For the slow cooker, add all your ingredients and set it on low for 6-8 hours. Before you get started, gather and prep your ingredients for an even quicker cook time and clean up. Then, drizzle your olive oil, coconut oil, or other keto-friendly fat in the bottom of your Instant Pot and set the timer for 5 minutes. Throw in your onions, celery, and carrots, and let these saute until the onions become translucent — which takes about 2-3 minutes. Cancel the saute function and press the manual button, adding 15 minutes to the timer. If you’re using frozen chicken, add 25 minutes. Add in your chicken breasts or shredded chicken, frozen cauliflower florets, bone broth, sea salt, pepper, and buffalo sauce. Give it a quick stir and close the lid, making sure the venting valve is sealed. Once the timer goes off, carefully release the pressure by switching the valve to venting. Once you release the pressure and no more steam is coming out of the valve, remove the lid and stir in your heavy cream or coconut cream. Serve the soup topped with crumbled blue cheese and extra sliced celery for a little crunch, if you feel like it. Add oil to coat the bottom of the Instant Pot. Press SAUTE function + 5 minutes. Add in onion, celery, and carrots, saute for 2-3 minutes. Select cancel then press MANUAL +15 minutes (+25 if using frozen chicken). Add chicken breasts and frozen cauliflower florets, chicken broth, salt, pepper, and buffalo sauce. Close lid and seal valve. When the timer goes off, carefully release pressure and remove the lid. Stir in heavy cream/coconut cream. Serve and top with crumbled blue cheese and extra sliced celery if desired. Is Vegetable Oil Bad For You? The Top 7 Vegetable Oils To AvoidDo Calories Matter On Keto?